A video of soprano Kathleen Battle from last evening's performance in Philadelphia of "Underground Railroad: An Evening of Spirituals" proves she still has plenty to sing about with that famous lyric voice. The project started a couple of years ago, inspired by Peter Gelb when he was still at Sony, and has toured ever since. "Legendary soprano Kathleen Battle's newest program celebrates the roots of African-American music and freedom via the Underground Railroad. Battle's sumptuous voice takes flight in this evening of enchanting music, featuring favorite and meaningful spirituals, hymns, and musical majesty. Although Battle's luminous soprano voice has graced the world's great opera houses and concert halls, there is a special place her heart for the songs and spirituals of the African-American journey. 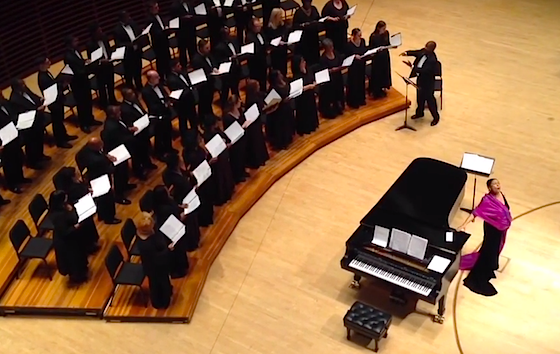 In this moving evening, Battle and acclaimed pianist Cyrus Chestnut explore the music that expressed the suffering and salvation of enslaved Africans as they found their way to freedom." [Source] Read an exclusive interview about the concert here and how Peter Gelb inspired the project here. Watch the soprano sing "Fix Me" after the jump. Below is a video interview and rehearsal footage from local CBS Philadelphia.